I normally buy 3 packs for a family of 6. In the morning, take out of the soup base and pat the skin dry and scour the skin with a knife, lay it skin down on a bed of course sea salt and put back into the fridge uncovered for at least 6 hours. This will help dry out the skin of moisture. 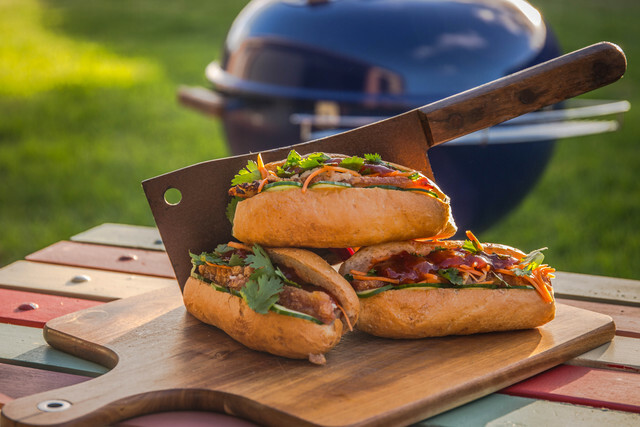 Spread some sweet chilli mayo in each bun, add a few slices of pickled cucumber, a few slices of thinly cut pork belly, then some pickled carrots and coriander leaves and top with the relish. It wasn't me......Well maybe it was..
That looks super delicious. Thanks for sharing. Love the 2nd photo. Wow, I've been wanting to do this for a long time and keep seeing cooks for it but this takes the cake for sure! Do the veggies end up like banh mi? BAHN MI!!!! That looks so amazing!!!! Just need some cilantro, Viet mayo, and pate...I'm drooling 襤襤襤 I haven't made banh mi in a while, need to be do it soon. Haven't seen a cook from you in a while, glad to see this one! I would so eat that. Great job!!!! Cheers, yeah I've been so busy drinking over the Christmas break I wanted to put my own spin on this as my kids aren't keen on the pate and such. They loved these.